Back-to-back touchdowns in the second quarter gave Norcross a 21-19 lead at halftime, but the Mill Creek Hawks scored the final 17 points of the game for a 39-24 victory over the Blue Devils. Chancellor Lee-Parker scored his first touchdown of the night on a 9-yard run with 4:38 in the first to add to a 32-yard field goal by Sam Stites and a safety earlier in the quarter. Kam Jackson cut into the Hawks lead with a 2-yard run for Norcross that capped off a 10-play, 74-yard drive, but Lee-Parker broke free for a 31-yard trip to the endzone to put Mill Creek up 19-7 early in the second quarter. Norcross quarterback Louis Williams found Isaiah Wilson in stride for a 64-yard touchdown and Christian Sims on a 15-yarder to take a 21-19 lead (205 first-half yards on 15-of-20 passing) at the half. After a 34-yard field goal by Stites that put Mill Creek up 22-21, Norcross took the lead again with 3:42 left in the third with a 22-yarder by Kellen Grave de Peralta. 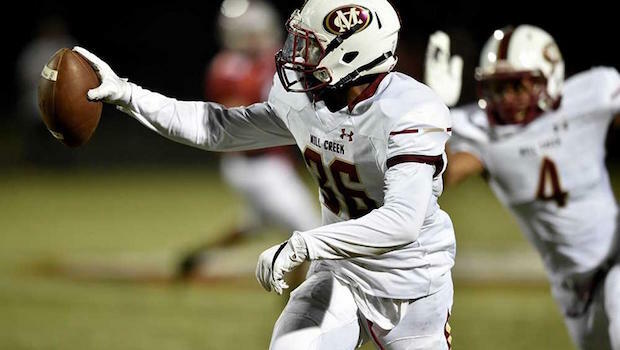 Lee-Parker reclaimed the lead for the Hawks a minute later with his third touchdown (23 carries for 214 yards through three quarters) of the game, and Brock Pelligrino’s 30-yard field goal and Brock Skinner’s 26-yard interception return with 5:29 to play sealed the Mill Creek victory. Playing in the first-ever Freedom Bowl as its host, Milton’s first score of the night came off a blocked punt, which Senior Charlie Keeney recovered and took to the house for the touchdown. A field goal from Cardinal Gibbons cut the Eagle’s lead, but a rushing touchdown from Milton’s Joshua Edwards extended the lead to 14-3 with a minute left in the first. With less than three minutes left in the half, Edwards scored again from two yards out to offset a Chiefs touchdown. Edwards continued to find success in the third, rushing into the end zone for another score to give the Eagles a 28-10 lead. In the fourth, Milton scored twice more including another dominant run by Edwards to soundly defeat Cardinal Gibbons. Edwards finished the night with 79 yards on the ground and four touchdowns, while quarterback Jordan Yates finished with 243 passing yards and one touchdown. A big third quarter and two touchdowns by the Raider defense propelled Walton to a 35-3 road victory over the Pope Greyhounds. KD Stokes made the first of his two trips to the end zone as the clock expired at the end of the first, and a 50-yard interception return by Brandon Spencer gave the Raiders a 14-0 lead at halftime. An 11-yard run by Kendall Alford and a 2-yard run by Stokes doubled the lead, and Jalen Wilson’s fumble recovery in the end zone put the Raiders up 35-0 with 4:21 left in the third quarter. Pope’s only points of the night came with 9:23 to play on a 29-yard field goal by Standfest Huds. Bergen Catholic traveled from New Jersey to meet Grayson in the “Gwinnett vs. World” double-header held at Buford High School and handed Grayson its first loss of the season. With 7:08 left in the first quarter, Bergen’s junior quarterback Andrew Boel found senior Garrett Cody for a 29-yard touchdown. A muffed punt by Grayson allowed Bergen’s Amar Gist to recover the ball and take it into the end zone less than two minutes later, but a blocked point after attempt kept the lead at 13-0 with 5:41 left in the opener quarter. Grayson got on the board with a successful 33-yard field goal just four seconds left before the half to make it a 13-3 game headed into halftime. Early in the third quarter, Gist came up big for Bergen again with a 28-yard touchdown run on 4th and 9 for his second touchdown on the night. One more score before the fourth quarter put Bergen up 27-3 before the Rams began to get back into the game. Grayson quarterback J’Kori Jones took the first snap of the final frame in for a touchdown, but the Rams would only be able to take a 19-7 advantage in the quarter and were outdistanced by the Crusaders. The Archer Tigers coasted to a big win over host Spartanburg behind a 5-touchdown performance by quarterback Carter Peevy. Two of Peevy’s scores came in the first on a 41-yard pass to Braylen Weems and a 5-yarder to Jeremiah Cook, who ran it in himself in the first quarter as well. The Tigers extended the lead to 34-0 with Weems’ second touchdown reception from Peevy and a returned interception by Emmanuel Michel, and Peevy found Trey Messer before the end of the half and Turner Wolfe in the third for a 48-7 lead. Rykeem Ferguson caught his second touchdown of the night for Spartanburg with 2:07 in the third, and a 44-yard field goal by Jacob Waters for Archer and a 42-yarder by Henry Bishop for Spartanburg (at the ends of the third and fourth quarters, respectively) resulted in a 51-17 final. Visiting Brookwood got a 30-yard first quarter field goal from Dylan Schefske and senior running back Chris Carter gave the Broncos a 17-0 edge at the half with two rushing scores in the second frame. Carter ran in his third touchdown less than three minutes into the third quarter and quarterback Conner Chavis iced the game minutes later with a touchdown pass to sophomore Zac Dyler to push the lead to 31-0 heading into a running clock fourth. Marietta quarterback Harrison Bailey finished the first half 22-of-30 passing for 276 yards and two touchdowns as the host Blue Devils took a commanding 28-0 lead. Arik Gilbert secured 10 catches for 133 yards and a touchdown in the first half and Ramel Keyton hauled in five catches for 63 yards and a touchdown. Running back Kimani Vidal racked up 43 yards and a pair of rushing touchdowns off his 10 first half carries. Isiah Love ran in a 64-yard Collins Hill touchdown on the first play of the second half, but Bailey answered with a 1-yard quarterback sneak and put Marietta back up 35-6 and kicker Cooper Kipp was successful on his only attempt of the game and pushed the lead to 38-6 entering the final frame. Forsyth Central took control of the game early, opened the first quarter with a field goal while limiting Cass to just three total plays in the frame. Sophomore quarterback Ryan Van Uum rushed for two scores in the second quarter to make it a 17-0 edge at the half. Cass quarterback Rett Moore found Jacques Fountain on a 22-yard touchdown pass midway through the third quarter to bring the Colonels within 17-6, but a Devran Orsan 4-yard touchdown run with 4:26 left gave Forsyth Central and commanding 24-6 lead. Moore scored Cass’s final touchdown on an 8-yard touchdown run with 2:12 left in the game. After a defensive stop against host Mountain View, Dacula’s Senior Jalen Perry shook some tackles and broke free for a long run on the Falcon’s first drive of the game. Junior quarterback Jarrett Jenkins kept the drive moving with a quarterback sneak that put the ball on Mountain View’s 20-yard line and the Falcons punched in a 1-yard touchdown, to go up 7-0 early in the first. With 3:34 left in the opening quarter, Mountain View senior quarterback Luke Hennebaul responded with a short touchdown run of his own, but a blocked extra point kept the Falcons up 7-6. Early in the second quarter, Mountain View junior Jacob Lund came up big with a strip sack that was recovered by teammate Jeremy Tuider, setting up the Bear’s second score of the night. With 4:00 left in the first half, the Dacula offense found the end zone again after a touchdown pass from Jenkins to junior Christopher Scott, making it a one-point game in favor of the Falcons heading into the half. A scoreless third quarter kept the Falcons ahead 14-13 going into the final frame. Mountain View scored the go ahead touchdown with 6:23 left along with a two-point conversion to take a 21-14 lead. The Bears held on strong to seal their victory over the Falcons. Mountain View Junior running back Enoch Walters had a big night, finishing the game with 124 rushing yards and a touchdown. The Roswell Hornets used a consistent, potent offensive attack to get the win over the visiting Centennial Knights. Roswell’s first touchdown came with 5 minutes left in the first quarter with a 3-yard rush from Kamonty Jett. The second quarter saw two touchdowns by Roswell, including a 44-yard pass by Ethan Roberts, and a 15-yard rush by Jett. The Hornets held a 21-0 lead to end the first half. While the Knights found themselves in a pretty deep whole to begin the second half, they scored 21 in the the third while the Raiders were only able to score 6. With about 5 minutes to go in the third, Centennial put themselves on the scoreboard with an 8-yard touchdown pass. On the following possession, Roswell scored with a 70-yard pass to John Copenhaver. The Hornets missed the extra point attempt. A 12-yard pass touchdown and a 3-yard pass touchdown by the Knights brought the score to 27-21 at the end of the third in favor of the Hornets. The Knights were unable to put themselves on the scoreboard during the fourth, while the Hornets scored two touchdowns including a completed pass to John Copenhaven for 87 yards. A dominating win by the South Forsyth War Eagles over the Etowah Eagles began with a 35-yard touchdown pass from Drew Morris to Pierce Meier with about 9 minutes to go in the first quarter. The following possession ended quickly as Etowah’s Justin Sherrer scored off of a 94-yard kickoff return tying the game at 7-7. The second quarter was all South Forsyth, as they scored 16 points off a 1-yard rushing touchdown from Daryn Rogers, a 31-yard Field Goal from William Bota De Sosa, and a 25-yard pass from Morris to Mitch Thompson. The first half ended with a score of 23-7 in favor of the War Eagles. The only remaining points for Etowah came in the third with a 65-yard rush by Klivert Many. The War Eagles scored 13 more points in the third with a 2-yard rush from Daryn Rogers, and a 42-yard pass from Morris to Cameron Schurr. Neither team scored in the fourth quarter. The Harrison Hoyas trounced host River Ridge in region play, riding a three-touchdown first-quarter performance by Micah Davis to a comfortable victory. Two of Davis’ three scores came on blocked punts — the other on a run — and River Ridge’s only points of the night came in the second to cut the Hoya lead to 21-10. Jay Ziglor, David Robert and Justin Lewis each had rushing touchdowns for Harrison, and Ziglor also scored on a reception from quarterback Gavin Hall for 28 straight points and a 49-10 final. The Sequoyah Chiefs won big on the road in region play, accruing a 47-0 lead in the first half and coasting to a 53-0 victory over host Osborne. Quarterback Collier Pecht opened the game with three straight touchdown passes to Myles McGee (18 yards), Emmanuel Jenkins (14 yards) and Cole Jacobs (65 yards) before the run game took over. Colin Koprowski found the endzone on a 9-yard run before the end of the first, and Jackson Smith (3 yards), Mason Webster (18 yards) and Jaden Mitchell (10 yards) had rushing touchdowns in the second quarter. Timothy Pittman’s 2-yard run provided the final points of the night during the second-half running clock. The Creekview Grizzlies secured a win over the Allatoona Buccanners due mostly to a strong first-half offensive effort . At the end of the first, Creekview was up 7-0 thanks to a touchdown from Paxton Naymon. The Buccaneers put themselves on the scoreboard with 9:30 left in the second quarter with a 50-yard field goal from Jude Kelly. The Grizzlies subsequently responded with two touchdowns, including a 70-yard run by Ethan Dirrim and a completed 40 yard pass by Jacob Pfundt. Although the Grizzlies were up 21-3 at the half, the third quarter belonged to the Buccaneers. Allatoona scored 10 in the third with a touchdown from Dante Marshall, and Jude Kelly completed his second field goal of the evening to bring the score to 21-13 at the close of the quarter. The Buccaneers went scoreless in the fourth quarter, and Jacob Pfundt scored a field goal with 1:52 left in the game. The visiting Cardinals grabbed a 7-0 lead in the opening quarter with a 61-yard touchdown pass from Tremir Alexis to Rasheed Singleton. Cardinals kicker Fernando Lobo extended the lead to 10-0 with a 32-yard field goal and Kendaris Hillman capped off a 13-play drive and closed out the first half with a 1-yard touchdown run to give Jonesboro a 16-0 lead. Lobo was successful on a 27-yard attempt with 4:30 left in the third quarter and Woodland’s Sharif Brown finished a 79-yard drive with a 1-yard touchdown run with 3:32 left for the only points of the final frame. An interception returned for a touchdown was the difference as host McIntosh held on to win a defensive battle over Henry County. On the first Henry County drive of the second half, McIntosh sophomore Ben Anderson made an adjustment for a play he noticed Henry had run earlier — a quick bubble screen — and broke on the ball, grabbed it out of the air, and carried it in 50-yards for a touchdown. Jaden Nelson, another sophomore, came up big for the Chiefs with five tackles for loss and several quarterback rushes. Senior outside linebacker Ryan Sanders, who is also the punter, made the game-sealing interception and kept Henry County pinned with precise and deep punts. McIntosh was weathering injuries to their first two starting quarterbacks which allowed sophomore Hayes Herzog to lead the Chiefs to victory. Jones County struck first against host Northside Warner Robins when Jontavis Robertson caught a touchdown pass to put the Greyhounds up 7-0 with 5:53 left in the first. Northside managed to drive the ball to the Jones County 19-yard line, but a missed 46-yard field goal by senior kicker Cory Munson kept the Eagles off the board. With 5:53 left in the half, Jones County quarterback Hunter Costlow found Robertson on a 66-yard pass to give the receiver his second score of the night. The Northside defense came up big with a forced fumble and recovery in the red zone, but settled for a 32-yard field goal making it a 14-3 Greyhounds game before the conclusion of the half. Early in the third, Costlow was picked off by Senior William McCall, who returned the ball to the house to cut the Greyhound lead to 14-10. Costlow and Northside quarterback Jayden Daniels each threw a pair of touchdowns in the third quarter to keep the game close at 28-24 in favor of the Greyhounds, but a fumble by Daniels gave Jones County the ball back to put the game away with its final touchdown with just over two minutes left. Host Cartersville outgained Luella 339-to-(-18) in first half yardage and built a 55-0 lead before the Lions’ Garrison Rippa added the only points of the second half on a 35-yard field goal in the third quarter. Cartersville quarterback Tee Webb closed the first half 12-of-14 passing for 242 yards and six touchdowns and added 49 rushing yards and a score. Kaleb Chatmon and Marcus Gary each hauled in two receiving touchdowns in the opening quarter and Gary rushed for a touchdown to open the second quarter before Harrison Allen and Amari Orr capped the scoring Webb’s fifth and sixth touchdown passes of the half. First-year program Denmark took a 19-7 lead into the half and held off North Springs in a wild final two quarters to score the program’s first road victory. Quarterback Ben Whitlock found Ze’Vian Capers to put the Danes up 7-0, but North Springs quarterback Aaron Bell found Nick Keou to even it up 7-7. Sophomore running back Devin Ducille added two Denmark touchdowns to close the half, but failed PAT’s and conversions kept the lead at 19-7. Whitock extended the lead to 25-10 with a touchdown pass to freshman Emmanuel Futner to open the third quarter. North Springs chipped back with a Bell touchdown pass to Zahir Nichols, but Ducille’s third touchdown of the game pushed the lead back to 32-17. Bell hit Keou again for a 42-yard touchdown with 9:54 left, but Whitlock’s third touchdown of the game, and second to Futner, gave the Danes a 39-25 lead minutes later. North Springs’ Kyree Green ran in the final tally on a 34-yard touchdown. Hardaway’s Zavier Clark gave the Golden Hawks a 3-0 lead with a 27-yard field goal in the opening quarter. Dominique Ford connected with Tahjee Hudson on a 30-yard touchdown pass before the half and the score remained 10-0 entering the final quarter. Jaron Early opened up Hardaway’s 18-0 scoring advantage in the final frame with six minutes left on a 9-yard run, and a Marquise McCullen interception and Jordan Parker sack, forced fumble and fumble return touchdown with a minute left made it a 28-0 game. Host Flowery Branch got on the board first with a 74-yard touchdown pass from Elijah Gainey to Jalin Strown. Clarke Central answered with a 50-yard touchdown pass from Isaac Ward to Jonathan Sewell to tie it 7-7 entering the second quarter, but Gainey and Strown hooked up again for a 28-yard touchdown that put Flowery Branch up 14-7 at the half. Sewell ran a 10-yard score to tie it 14-14 entering the final quarter, but the Falcons finished strong in the final frame. Gainey connected with Strown for the duo’s third touchdown on a 6-yard pass with 6:49 left. And Leading 21-14, Flowery Branch’s Aiden Lopez forced a Gladiators fumble and teammate D.J. Brown recovered it to set up a game-clinching 2-yard touchdown run by Zarian Brawner with just 4:19 to play. After a slow start, Marist put together a 33-14 victory over Baylor School in Tennessee. Lincoln Parker scored first for the War Eagles on a 4-yard run with 1:17 left in the first, but Baylor tied it up midway through the second on a 3-yard Noah Martin rushing score. The Red Raiders appeared to gain momentum on a fumble recovery on Marist’s next possession, but Kyle Hamilton returned a blocked Baylor field goal attempt and returned it for a 13-7 lead with 3:34 in the half. A reception by Matthew Houghton extended the first-half lead to 19-7, and Hamilton’s 99-yard kickoff return to open the third and Parker’s second touchdown of the night put the War Eagles up 33-7 with a quarter and a half to go. Host St. Pius held a Westminster offense that entered the game averaging 39 ppg per game to only a made 52-yard field goal attempt by Charlie Ham in the opening quarter. St. Pius seized control in the second quarter with a Connor Egan touchdown run and a 35-yard Egan touchdown pass to Chris Miller that gave the Golden Lions a 14-3 halftime advantage. Westminster blocked a punt and returned it for a touchdown in the third quarter for the Wildcats’ final points before a trio of St. Pius rushing touchdowns, including a 31-yard scamper by DJ Mitchell iced the game. The defending champs took a 38-6 lead after the first quarter to outclass and overpower Therrell at home. Calhoun relied on three touchdowns from star back Zach Fuller (24, 8 and 5 yards). Jerrian Hanes (3-yard) and Julian Ipac (14-yards) each had a touchdown run.Quarterback Gavin Gray passed to Luke Moseley for a 15-yard touchdown and Bralin Barton returned a punt 45 yards for a touchdown. Eduardo Fajardo kicked a 31-yard field goal. The Yellow Jackets forced a running-clock in the second half. Lovett quarterback Blaine McAllister threw two touchdowns and ran it in for two more to lead the Lions to a 43-0 win over visiting B.E.S.T. Academy. Senior KJ Wallace and McAllister each had short runs to give Lovett a 14-0 first-quarter lead, and the two connected early in the second on a 22-yard pass with a diving, one-handed catch by Wallace in the endzone. An interception by Collin Goldberg put the ball back in McAllister’s hands before the end of the half, and he ran it in himself for a 30-0 halftime lead. McAllister found Lance Beck in the third on a 22-yard pass for his final score of the night, and John Russ had a 2-yard rushing touchdown in the fourth. Head coach Brian Allison won his 100th game with Union County and 125th overall as the Panthers outclassed Towns County. The Indians struck first, on a 61-yard touchdown run on 4th-and-1, but Union County responded with 45-unanswered points to cruise past Towns County. Union County took a 38-7 lead which led to a running-clock in the second half. Ean Harkins had two interceptions on the night, including one for a touchdown. Chad Buzzard’s 5-yard touchdown run pushed the lead to 14-7 and Sawyer Drake’s 21-yard reversal pushed the game to 21-7 before Harkins’ interception return touchdown made it 28-7. Brian Smith pushed the lead to 31-7 with a 27-yard field goal and Buzzard scored again just before the half to push the lead to 38-7. Pierson Allison’s screen-pass to Drake on 4th-and-long found the endzone and brought the game to its final tally. Prince Avenue Christian did not take its first lead of the game until early in the third quarter when a 2-yard touchdown run by sophomore quarterback Brock Vandagriff put the visiting Wolverines up 28-21. Wesleyan tied it back quickly, but a 40-yard scamper by Vandagriff with just 13 seconds left in the third quarter put the Wolverines back in front and ignited the 21 unanswered points used they used to close the game. Teammate Christian Parrish scored on an 11-yard touchdown run for Prince Avenue Christian’s first points and played the role of closer by finding the end zone from 10 and 26 yards in the fourth quarter. Vandagriff connected with Mack Simmonds for touchdowns of 77 and 37 yards in the first half in addition to his two clutch second half touchdown runs.